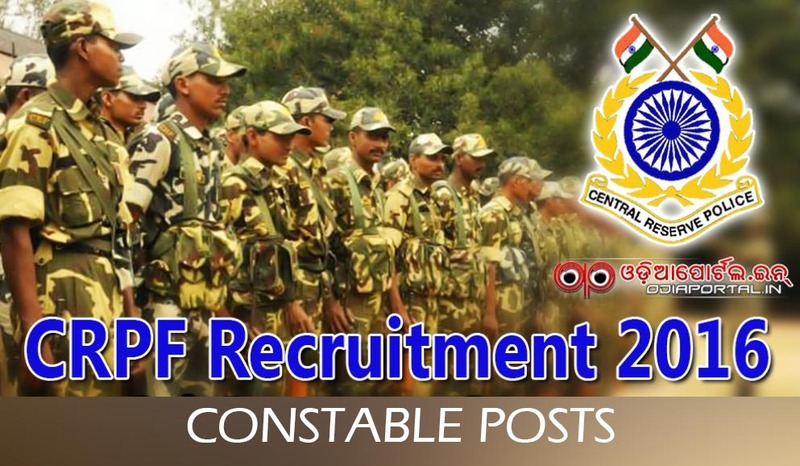 Central Reserve Police Force (CRPF) — Central Zone inviting online application for the recruitment of 1247 Constable (Technical & Tradesmen) vacancies for Male/ Female in — Central Reserve Police Force. Eligible ordinarily residents of — Bihar, Chhattisgarh, Jharkhand, Madhya Pradesh, Odisha, Uttar Pradesh, Uttarakhand & West Bengal may apply online from — 11-02-2016 to 10-03-2016. Selection Process: Candidates will be selected based on physical standard test, physical efficiency test, written test, trade test, checking of testimonials/ documents, medical examination. Educational Qualification: Candidates should possess Matriculation or 10th class pass with Transport Vehicle driving license for CT/ Driver, Matriculation or 10th class pass with ITI Certificate in relevant trade for CT/ Fitter, Matriculation or Xth class pass with proficient & relevant experience for all other posts. Age Limit: Candidates age should be between 21-27 years for CT/ Driver, 18-23 years for all other posts as on 01-01-2016. Age relaxation is applicable 5 years for SC/ ST, 3 years for OBC & for others as per rules. Examination Fee: Candidates have to pay Rs. 50/- through SBI Challan or through Net Banking using Debit card/ Credit Card or through E-Challan of post office. No fee for SC/ ST/ Females & Ex-Servicemen candidates. How to Apply: Eligible candidates may apply online through the website www.crpfindia.com from 11-02-2016 to 10-03-2016.